We hope you enjoyed the holiday season and wish you and all our furry family and friends the best in the coming year. We appreciate everyone's support through the transition to K9's Daycare Deluxe program. The dogs love the new puzzles and games, and we are really enjoying the smaller groups and extra activities. As we start the new year, we want to offer our loyal clients an opportunity to lock in ten nights of boarding at last year's rates. 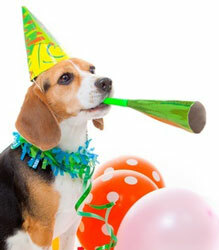 Effective January 1, boarding at K9 Country Club is $35 per night. Dogs who require medication are $40 per night. You can save $70 when you purchase a 10-pack of boarding nights at the previous rate of $28 per night. The special rate does not include any extra services or fees and must be used by May 31, 2016. Any remaining balance on your account after the expiration date may be applied to future boarding nights at our regular rate. The sale starts January 6 and ends on January 11, so give us a call and start the new year off with some savings. Limit of one 10-pack per dog. Thanks, too, to everyone who came out for pictures with Santa. We raised $816 for Wags to Riches. Awesome! 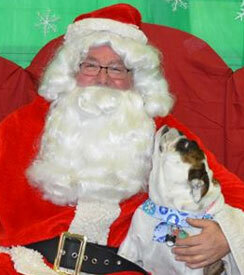 Ruby was the winner of our photo contest and enjoyed her time with Santa and her stocking stuffed with goodies. In these extremely cold temperatures, it's important to take some extra precautions to ensure your dog is healthy and happy. Warm and dry - Your dog's fur may not be enough to keep him or her warm in cold weather. Short-haired dogs may require a sweater when the temperatures drop. In sub-freezing weather, your car can act like a refrigerator, so never leave your dog in an unheated car. And remember… if it's too cold for you outside, it's too cold for your dog (or your cat). The safest place for your pets is inside with you.